Messier 67 (M67), nicknamed the King Cobra Cluster, is an open cluster located in the northern constellation Cancer, the Crab. The cluster has an apparent magnitude of 6.1 and lies at an approximate distance of 2,610 to 2,930 light years from Earth. It has the designation NGC 2682 in the New General Catalogue. Messier 67 can be found roughly halfway and slightly above the imaginary line connecting the bright stars Regulus in Leo and Procyon in Canis Minor. The cluster lies only 1.75 degrees west of Acubens, Alpha Cancri, a multiple star system with a visual magnitude of 4.20. 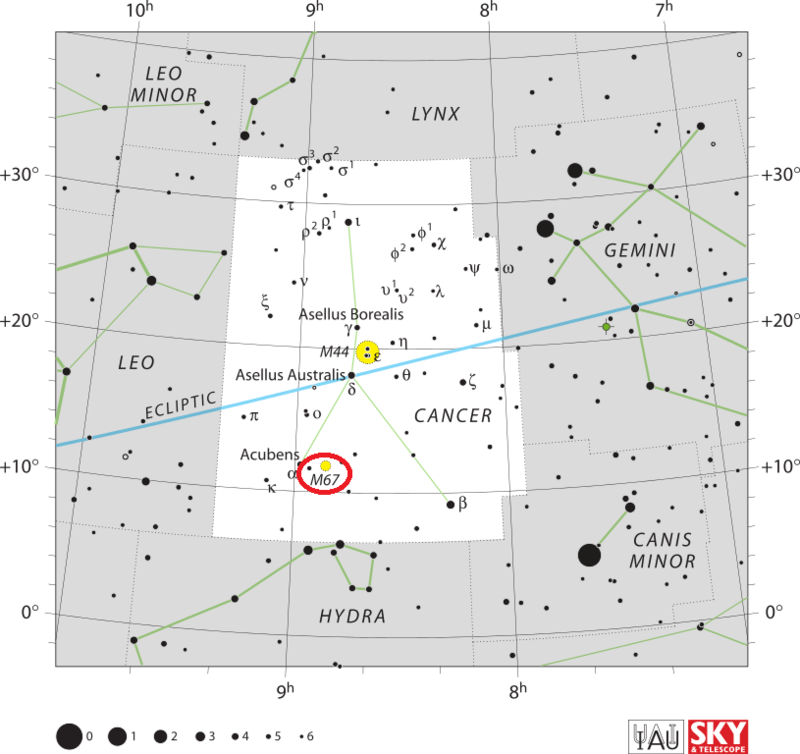 Acubens is located about 9 degrees southeast of Messier 44, the famous Beehive Cluster. With an apparent diameter of 30 arc minutes, M67 appears roughly the same size as the full Moon. Small 10×50 binoculars show the cluster as an elongated patch of light, while small telescopes reveal its brightest stars. 6-inch and 8-inch instruments resolve dozens of stars, while 12-inch telescopes reveal about 100 individual stars in the cluster. The best time of year to observe M67 from northern latitudes is during the late winter and early spring. 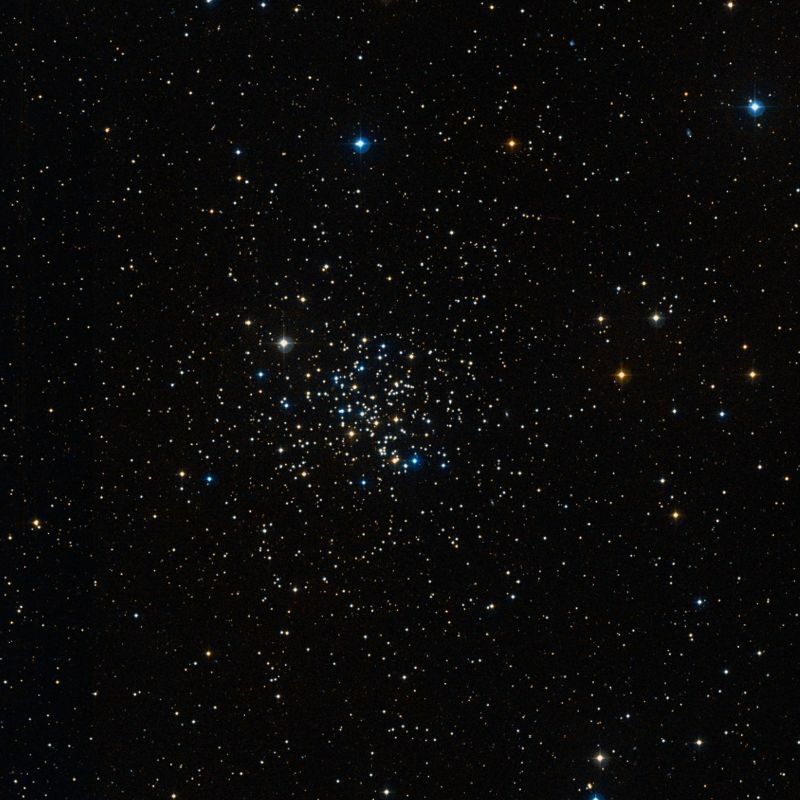 Messier 67 is one of the oldest known open clusters and the single oldest open cluster listed by Messier in his catalogue. The estimated age of M67 is in the range from 3.2 to 5 billion years. The few open clusters that are known to be older are not as close to Earth as M67. These include NGC 188 in the constellation Cepheus, with an estimated age of 5 billion years, NGC 6791 in Lyra, which is believed to be about 7 to 8 billion years old, and Berkeley 17 in Auriga, with age estimates ranging from 10 to 13 billion years. NGC 188 is 5,400 light years distant and NGC 6791 lies at an approximate distance of 13,300 light years from Earth. The average age of the stars in the cluster is around 4 billion years, which means that they are roughly the same age as the Sun and have similar elemental abundancies. Open clusters are typically younger and the stars tend to disperse over time, usually before they reach this age. For example, the Beehive Cluster (M44), another Messier cluster in the Cancer constellation, is only 600 million years old. The stars of M67, however, are expected to stay together for another 5 billion years before dissociating. Messier 67 contains more than 500 stars and is often studied for the insight it provides into stellar evolution. The cluster contains 11 bright orange K-type giant stars and about 200 white dwarfs. With the exception of about 30 blue stragglers, the stars in M67 are all roughly the same age and lie at the same distance. The origins of the blue stragglers have not been explained yet. The brightest of these stars have the spectral classification B8 or B9 and a visual magnitude of 10, which makes them about 50 times more luminous than the Sun. 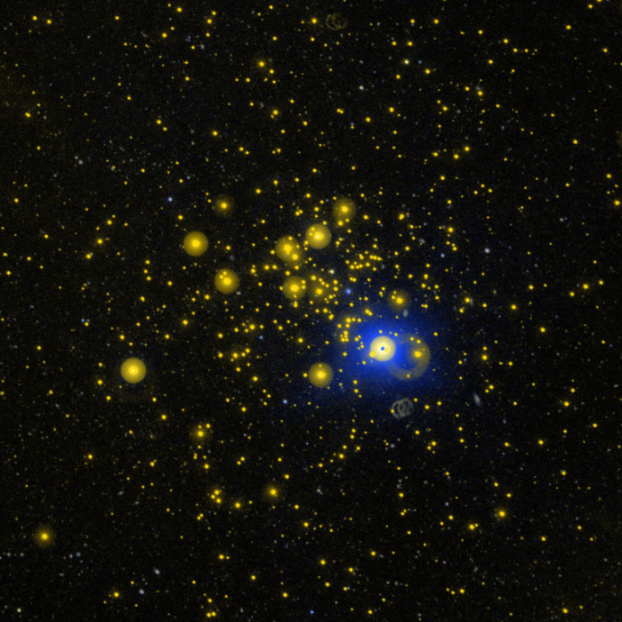 Not counting the blue stragglers, the cluster does not have any main sequence stars bluer than spectral class F.
Messier 67 has undergone mass segregation, which means that its heavier stars have moved toward the cluster’s centre and less massive ones have migrated toward the outer region over time. As a result, the cluster’s stars are much more gravitationally bound than those in younger open clusters. Messier 67 is given a Trumpler classification of II 2 r, II 2 m, or II 3 r, depending on the source. 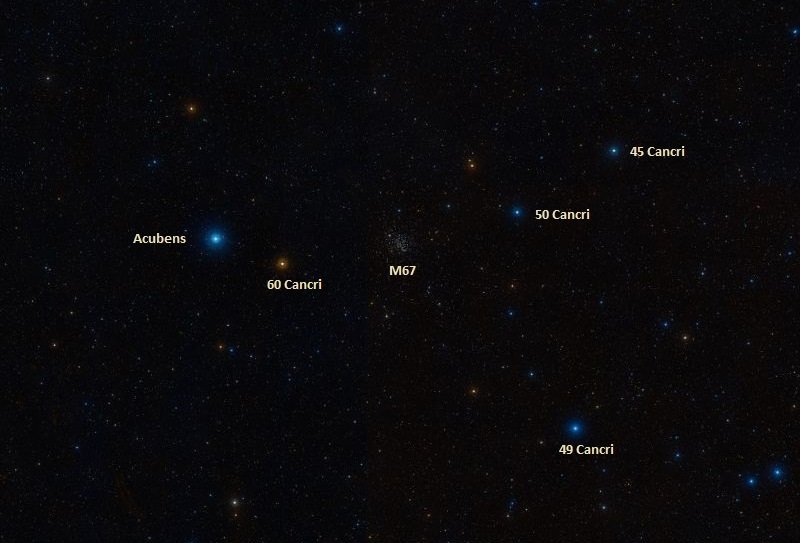 In spite of being one of the most studied objects of its kind, the basic properties of M67 – mass, age, number of stars of different types – vary considerably from one source to the next. The cluster’s mass, while uncertain, is estimated to be between 1,080 and 1,400 times that of the Sun and the distance is believed to be in the range between 800 and 900 parsecs. The cluster contains more than 100 Sun-like stars and a great many red giants. 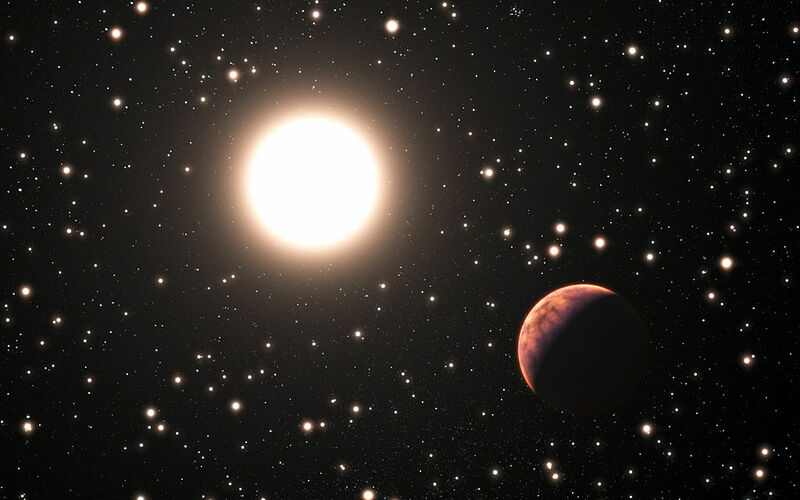 The high number of stars similar to the Sun had led scientists to consider M67 as the Sun’s possible parent cluster, but simulations have indicated that this was very unlikely. As the stars in M67 are all roughly the same age and have a similar composition to the Sun, the cluster is often studied by scientists looking to determine how many planets form in such environments and if they mostly form around more massive or less massive stars. In 2014, an international team of astronomers discovered three extrasolar planets in the cluster using the HARPS (High Accuracy Radial velocity Planet Searcher) instrument on ESO’s 3.6m telescope at the La Silla Observatory in Chile. All three planets are closer to their hosts than the habitable zone, where liquid water could exist. Two of the exoplanets were detected circling the dwarf stars YBP1194 and YBP1514, while one was found orbiting a K3-type giant star, designated S364. Two of these planets, designated YBP1194b and YBP1514b, are the first exoplanets ever discovered orbiting Sun-like stars in an open cluster. YBP1194b, orbiting the star YBP1194, has a period of 6.9 days and a mass of at least 0.34 Jupiter masses. The star itself is one of the closest solar twins ever found. Its properties are almost identical to those of the Sun. The planet YBP1514b has an orbital period of 5.1 days and a mass 0.40 times that of Jupiter, while S364b takes 121.7 days to orbit its parent star and has a mass of at least 1.54 Jupiter masses. The discovery of these planets showed that planets are about as common in open clusters as they are around isolated stars. However, they are not very easy to detect and very few of them have been discovered inside open clusters. The first ever planet to be found in an open cluster was detected orbiting the star Ain, Epsilon Tauri, one of the members of the famous Hyades cluster in Taurus. 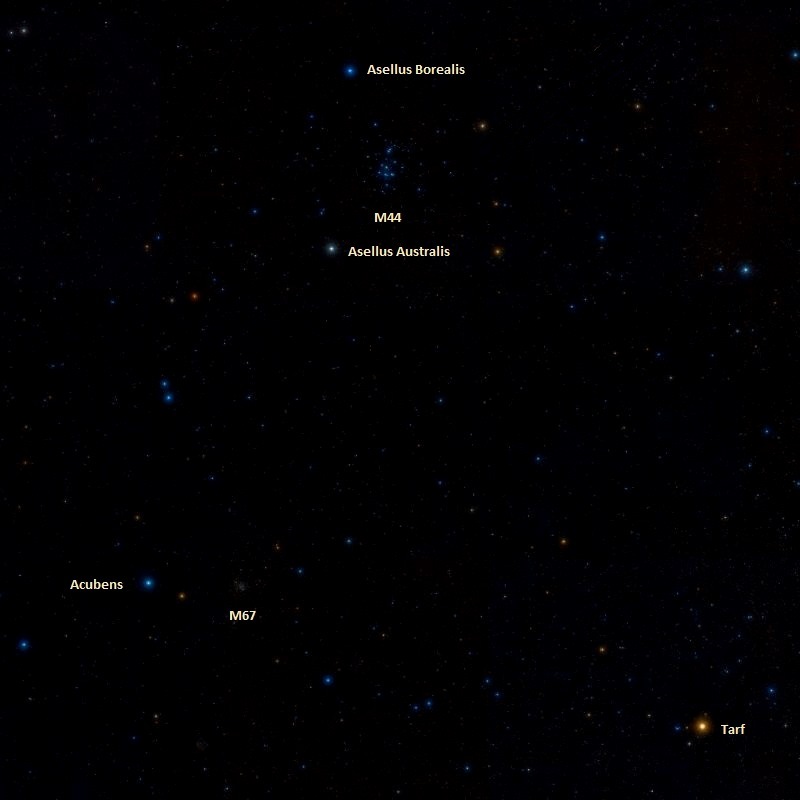 Scientists also recently discovered two planets in the Beehive Cluster (M44) and NGC 6811, an open cluster in Cygnus. A rich but loose cluster, at the root of the Crab‘s northern claw; where a line from Rigel through Procyon, into the east-north-east, will find it about 5deg north of Epsilon Hydrae. It consists principally of a mass of stars of the 9th and 10th magnitude, gathered somewhat in the form of a Phrygian cap, followed by a crescent of stragglers. It was first recognized by Messier in 1780, and resolved by Sir W. Herschel in 1783. The place here given was obtained by differentiation from Delta Cancri: and though differing so largely in AR from Messier, it is evidently his object. With a power of 157 on his large telescope, Sir William Herschel saw above 200 stars at once, in the field of view; and on gazing at it with my refractor, of far inferior light, but excellent definition, charged also with a power magnifying 157 times, as shown by a dynameter, the object appears as herewith presented. This artist’s impression takes the viewer on a trip through the old star cluster Messier 67 in the constellation of Cancer (The Crab). Observations using ESO’s HARPS instrument on the 3.6-metre telescope at La Silla in Chile, along with other telescopes, have found three planets orbiting stars in this cluster. The three stars with planets are marked with their names.